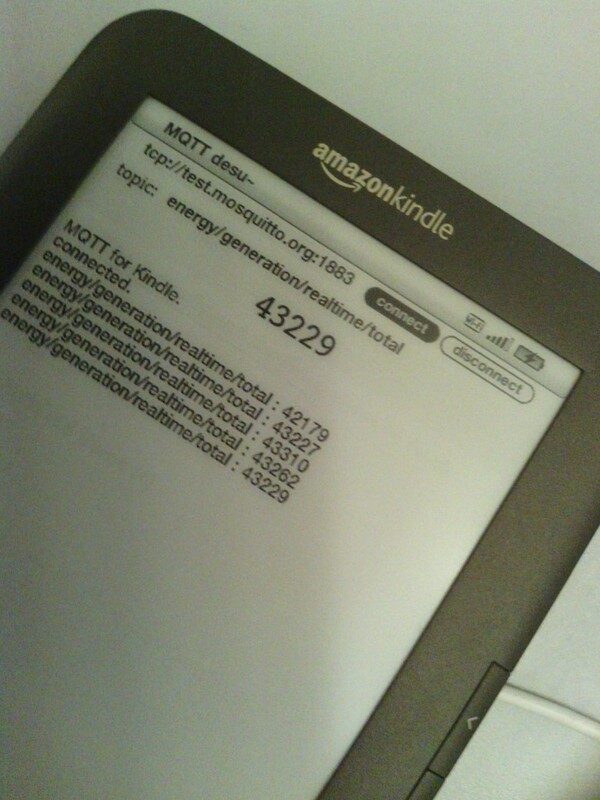 For London Green Hackathon I hacked together a proof-of-concept Kindlet (Kindle Applet) for monitoring environmental data in real-time that runs on a Kindle 3. Its actually a generic MQTT client that runs on a Kindle, but MQTT is a very popular protocol for transmitting environmental data so I think I can argue the ‘green’ values of this project. After all, Nanode is just an Arduino with an Ethernet port, that gets green badges. All the code was written after 1AM, thought the night and into the next day. Its somewhat rough around the edges. But given we were not sure if it would work at all, I am very happy with the result. The Kindle is NOT intended as a general use computing device. There is a SDK, but its closed and so far as I know very little has been done with it. Its basically for creating interactive books, not applications. Seems current bets are that is will remain this way. Hardware limitations aside, the software is really quite fragile. I am guessing there is a single JVM process for everything, and there is no sand-boxing. Any unhandled exceptions trigger a JVM restart. Installing apps on a Kindle requires several hacks to be applied to the device first. In order: jail-brake, usb-network, developer certificate and changes to the JVM security manager configuration. The last one is not required for all apps, but it was needed for this hack. Jail-brake and USB network: That page has all the required details and links to the jail-brake downloads. If the USB net freezes on you, try this. All Kindlets must be signed. Most people share the same certificate (keeps things simple) and this needs to be copied into `/var/local/java/keystore/developer.keystore’ on Kindle. Java security manager: MQTT requires permission to open a socket. By default the Kindle only allows Kindlets to do HTTP and HTTPS. By editing `/opt/amazon/ebook/security/external.policy’ and adding `permission java.net.SocketPermission “*:80-“, “accept, connect, listen, resolve”;’ we can get around this blocker. Writing Kindlets: this page is a very good getting started guild. The Hello World example Kindlet is a useful starting point. I think this page also helped. AWT / Kindle GUI: JavaDoc for the Kindle GUI tools. Its basically AWT with a custom set of widgets specially for the Kindle. Not the most clear guide but a good start. Generally I was able to deduce the remaining 10% of data by trial-and-try-angai-until-it-works-dam-it. But the final result? A funky Kindlet that can connect to any MQTT broker and tail the content of a topic space. Oh, and a greatly increased knowledge of how a Kindle hangs together. It really is an awesome device. Music, films, acting, painting… art of any kind. People always have an opinion. It is a completely open-access system. No special skills are required to understand and enjoy art… what would be the point in music that was only interesting to skilled musicians? A display of great skill earns great praise and respect, possibly fame. No one wants to know how a given tune was dreamed up, the tedious months of refining the composition, the 100 failed songs that preceded this one. The art in a work of art is all in the interpretation, the mind of the observer. Programming, coding, the process of making software. Call it what you will. I will go out on limb here and suggest that, for MEDCs at lest, software is more ubiquitous that art. Indeed all films, music, games are themselves dependent on software. As important as paint is to an artist. But when an artist creates a great painting, where is the credit to the chemist who create the paint? Paint is commodity. The beauty in any technique is its easy of repetition. A paint only has to be created once to benefit many artists. But the paint is too easy to obtain. In perfecting a manufacturing process the chemist has, ironically, removed their name from the world. No fame or praise is afforded to them. A job done too well is never acknowledged as having ever existed. What drives an artist? What do they seek? Material gain, certainly, but I suspect that is not all. To want to show off is to be alive. To have your existence acknowledged and counted. To prove that you are not just like everyone else. That there is something that only you can do. To a musician performing live in front of a large audience there must be such a sense of acknowledgement. My fate now is writing software. It has become a reflex – something not requiring exerted effort. Thought and planning, yes. But like the musician playing from memory, the code just flows. I never planned to be a software engineer. In a way, I tried quite hard not to be. The default choice, the easy and obvious choice, is usually the wrong one. Always taking the easy path leads to a dead end. No, worse than that. It leads to a straight path of more of the same. There is no performance in programming. With a life time of experience and honed skill and craft there is still no grand display, no art. No fame, no praise. The great enablers of technology so often unknown, lost in history. In a world of billions, strive to set yourself apart and assert your existence. Be noticed, be remembered. In software, is this possible? Will more remain than unfixed bugs and sarcastic commit comments? How many are remembered for their code? Ideas yes, but the art of coding? If code is incomprehensible to non-coders, then can such even be possible? A common theme in the Earthsea books is that it takes power to know power. You can not comprehend someone’s skill without first possessing a near level of skill yourself. People have always mistrusted magic. This is a blog entry that I have been thinking about writing for years. It has then been hastily written and sat on for several weeks. Apologies for the D&D reference in the title. You are currently browsing the Vague Hope blog archives for January, 2012.